The weather through the first half of this time period was just about perfect being 68-75 degrees having sun mixed with clouds. The second half we had a mixed bag with a few days giving us some heavy rain and windy conditions. But as we know weather affects the fishers more than the fish and those who persevered through the conditions did well. Long time return guests, father & son, Rich & Brian Jicha from Avon, OH & Middleton, WI were glad to be back and quick to hit the water. DOA they caught 15 Northern Pike. 1st full day they had a fabulous day catching 57 Northern Pike with a lot 28 to 32-inches. 2nd day was all bigger fish landing a dozen & having many more follows. After supper Brian had a MONSTER, over 40” Northern Pike, follow his lure up to the boat several times but would not hit his bait. 3rd day was searching for big Muskie and they found them. They had many follows on BIG Muskie and Rich said that without exaggerating one of the Muskie was at least 4 feet long. 4th day they had one of the best days they ever experienced fishing catching 70 fish, 64 Northern Pike and 6 Smallmouth Bass & each caught an 18.5-19-inch trophy. 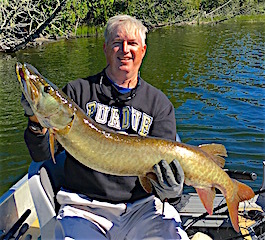 5th and final day they fished a portage lake for Muskie catching two up to 31-inches, Brian saying they had many BIG Muskie follow their lure to the boat. They also caught a bunch of Big Smallmouth Bass with Rich landing 3 Trophy qualifiers at 18, 18.5 and 19-inches. Both went home having a FABULOUS time making fishing GREAT memories between father & son. Guest since 1994 Gerald Adams from Shawnee, OK was back making his traditional father & son fishing trip with son Zack. 1st full day they caught 15 Smallmouth Bass with Gerald catching an 18” Trophy. 2nd day was a very rainy day with Gerald & Zack deciding to opt out and have a relaxing day in. 3rd and final day they caught some of their favorite fish, Smallmouth Bass and soaked up as much of the wilderness atmosphere they have become so attached to. 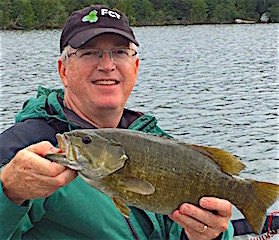 Gerald & Zack come to Fireside Lodge for other reasons than the Great Smallmouth Bass Fishing they have experienced. 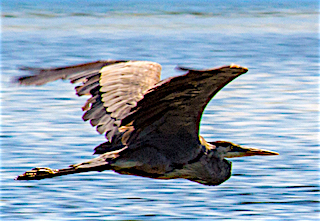 The wonderful Wilderness and Wildlife are a big reason but it is also a lot about the people. The numerous people they have met and enjoyed conversation with over the many years staying with us at Fireside Lodge since 1992 have created a special connection with Gerald and Zack that I think means more to them than anything else. Also, the people that have met them have been blessed to do so. We thank Gerald & Zack for making Fireside Lodge their home away from home to make wonderful memories between father & son. Ed and JoAnn Piotrowski from Hampshire, IL returned for their 3rd consecutive year. A lot happens in a year and for Ed he finished a personal goal of writing a book about his life journey with a fishing theme relating to his experiences since he was a little boy. I have known Ed & JoAnn since 1984 and they are truly wonderful people married for 42 years, a rare commodity these days, and I am sure Ed’s book will be enlightening and fun to read which I intend to do as soon as I have the chance. The title is “A Life Well Fished” and it can be purchased on Amazon.com. 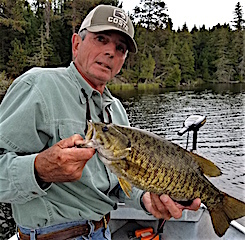 As for the fishing during their stay they enjoyed catching Smallmouth Bass and Northern Pike every day with both JoAnn & Ed each catching two Master Anglers Award Trophy Smallmouth Bass. 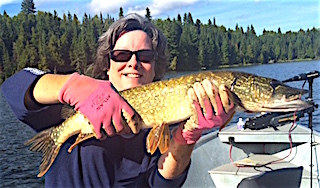 Ed caught their only Muskie measuring 31” and JoAnn directed this catch. As Ed was searching for a new lure, JoAnn out of the blue said use the Tequila Sunrise Rattle Trap. 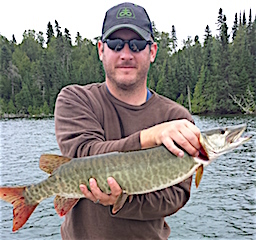 Ed followed JoAnn’s direction and about 10 casts later he caught his Muskie. 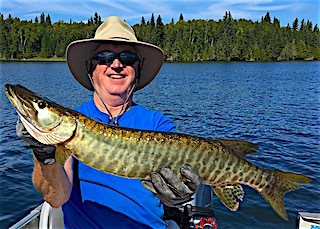 On the last day with only a few stops from calling it a trip Ed hooked into what he calls the Chamber of Commerce Fish and the fight was on with a mid-40” Muskie. As Ed described it was a great battle until the Muskie completely cleared the water and ungraciously flung the Rat-L-Trap back at the boat. Guess what color?? Tequila Sunrise! Both left having a wonderful time fishing, meeting other guests and are already looking forward to their return in 2017, already having reserved their dates. Long time return guests Steve & Debra Johnson from Halltown, MO were glad to be back. 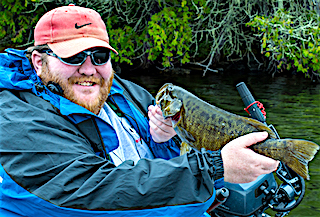 1st day was good caching 15 Smallmouth Bass up to 18-inches. 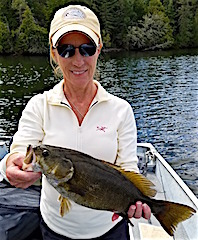 2nd day Debra stayed back for ½ day and they had good total results catching quality fish 16-17.5”. 3rd day was very good catching a good number of bigger Smallmouth Bass and Steve caught a big old pike measuring 38-inches. 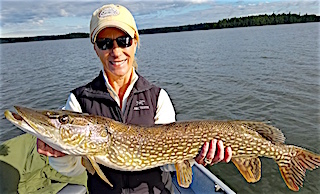 4th day was a very good day catching Big Smallmouth Bass and it was Debra’s turn landing a big 38-inch Northern Pike. 5th and 6th days were spent hunting down Smallmouth Bass and a good side story was during a lull in catching fish, which we all have from time to time, Debra pointed a fishing spot out to Steve and Steve reacted like, what are we doing here. Well no sooner that those words came out of his mouth Debra hooked and landed a Trophy Smallmouth Bass. 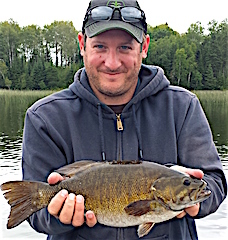 7th day was a good day finding the Smallmouth more grouped catching some beauties. 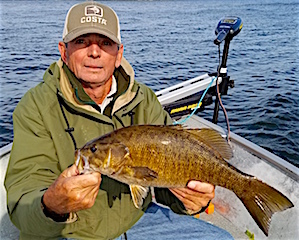 Next day they did well catching some big Smallmouth with Steve landing a 19-inch Trophy and losing one the same or bigger, plus they caught 17-17.5 inch Smallies. 10th & final day started with heavy rainfall that continued until about noon. As Debra decided to stay dry Steve fished alone doing very well catching a lot of large Smallmouth Bass. Both left having a fabulous visit and left hoping they can do it all over again in 2017. Carl & Peggy Olofson from Roselle, IL returned for their 2nd year in a row. 1st day fishing the caught a bunch of Smallmouth Bass and a few Northern Pike. 2nd day was a blast catching some Northern Pike and Smallmouth however the big excitement of the day was when Peggy hooked into a Muskie in the high 30” range. Well the fight was on a Peggy did everything to get it at boat side however the fish got off in the netting process. 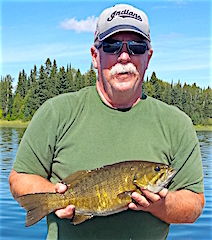 Also, Carl caught an 18” Master Anglers Award Smallmouth Bass. 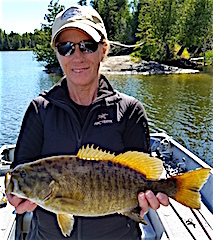 3rd day Peggy had the hot hand as they had great action on Smallmouth Bass & Pike. After returning to the dock for supper they were full of excitement but a bit worn out so that evening was spent enjoying conversation and a beauty of a sunset. 4th and final day was all about action on both Pike & Smallmouth Bass and according to Carl; Peggy was on fire catching most of the 18 fish. Both went home as they came with Big smiles on their faces thoroughly enjoying their stay and already looking forward to a return visit. Jim & Kathy Cron from Roanoke, IN returned for their 4th consecutive year. 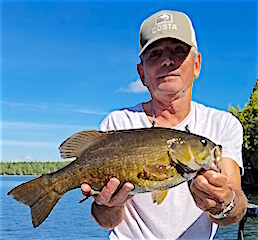 1st day on the water was wonderful picking up where they left off last year catching some beautiful Smallmouth Bass wacky worm style. 2nd day they had a great time Smallmouth Bass fishing routing up some big bass from some of their old haunts and Cathy caught a MONSTER Trophy Smallmouth Bass on a sinking worm I sold to her a year ago. She quickly bought some back up worms. Jim that evening pulled out a new 9-weight fly rod and on his 3rd cast got bit of by a Northern Pike. 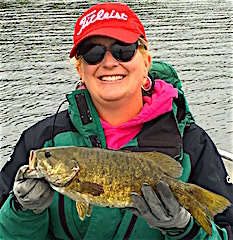 3rd day was another great Smallmouth Bass day and in the evening Cathy went fishing in her personal tube put in action by divers flippers. She had fun and had a few fish on that she lost. 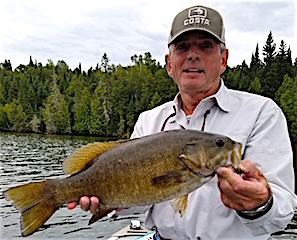 4th day Jim said they had a very good day catching their favorite fish, Smallmouth Bass and Cathy came up with the catch of the day landing a trophy size Smallmouth. 5th and final day they finished very strong catching many good size Smallmouth Bass. However with these two it is never just about the fish as they truly have a great day every day being on the water enjoying the wilderness and all it has to offer. 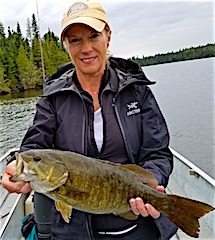 4th evening Jane tried out Cathy’s float tube & flippers and within 3 casts caught a beautiful BIG Trophy Smallmouth Bass that jumped like it was a made for TV fishing show. The setting could not have been better with an orange blaze sun setting in the horizon making a perfect backdrop. 5th and final day they did very well catching a lot of Northern Pike, Jane having the hot hand landing the majority of them. They left having tons of fun enjoying the company and conversations of other guests they have gotten to know over the years. Gary Johnson from Midlothian, IL returned for his 4th time with sons Pete & Josh and joining them 2 days later was John Riemer from Lincoln, NE. Day of arrival they got on the water at about 3PM and within 15 minutes Josh tied into a GIANT fish. 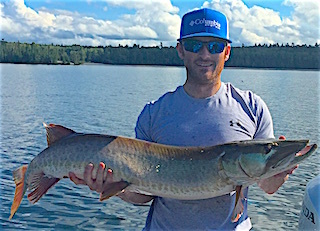 After a fun fight Josh landed a 49-inch Trophy Muskie. What even made it more exciting was it hit on a figure 8. All were very excited and Gary & Pete have some catching up to do. 1st day they went out and caught 30+ Northern Pike up to 30”. 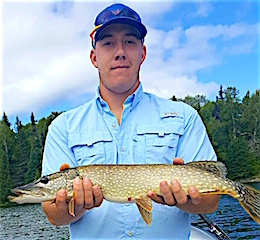 That evening John arrived and on day 2 Pete & Josh caught 12 Northern Pike including a 33 and 36-inch fish. 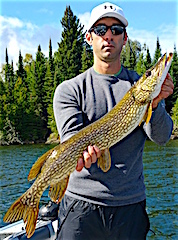 Gary & John did very well Pike fishing up to 1PM but not before John caught a 40-inch Trophy Northern Pike. 3rd day Pete, Josh, & John portaged to another lake catching a bunch of Northern Pike and 6 walleye, two being 26-26.5-inches. 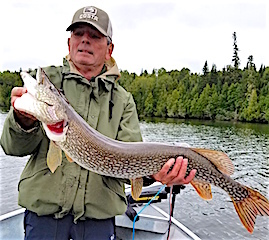 Meanwhile, as quoted by Gary, he was having the best fishing day of his life catching 24 Northern Pike up to 38-inches, 4 Muskie between 35-40-inches, and 6 nice Smallmouth Bass. Gary was so pleased with his day; he did not go fishing after supper for the 1st time. 4th and final full day of fishing Gary & Josh caught 17 Northern Pike and a Tiger Muskie while Pete & John caught over 30 Northern Pike. All departed having a fabulous time and Gary said he would be returning next year with a group of 6-8 People. Jacob & Danielle Anctil from Martensdale, IA were making their first appearance at Fireside Lodge after getting married this past Saturday. This is also their first time experiencing fishing in Canada and seeing everything this great wilderness has to offer. Day of arrival they caught their first Northern Pike in just a short time after supper. With the sun setting at 7:57 the after supper fish is shortened a lot compared to the longest day of the year when it sets at 9:38. 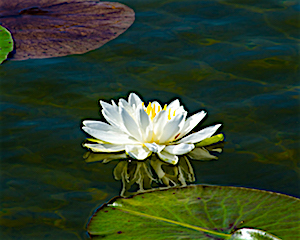 1st day was enjoyable discovering Little Vermilion Lake while fishing for Northern Pike. 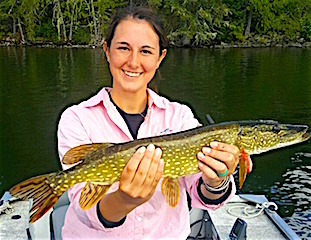 2nd day they ventured to the West End having a good day catching some Bigger Northern Pike up to 31-inches. 3rd and final day they were very excited about their day catching about a dozen bigger Northern Pike up to 33-inches plus they felt like they learned a lot figuring out Little Vermilion Lake. Jacob & Danielle had a lot of fun during their three days and made wonderful memories which will last throughout their many years together, and we thank them for selecting us a Fireside Lodge to take their first vacation as a married couple. Fran & Colleen Stack from Lorain, OH were back for the 13th consecutive year. 1st full day they had an action packed day catching many Northern Pike, losing at least as many as they caught, and having many strikes without hook ups. As Colleen described the day pulling up to their dock slip “FABULOUS”! 2nd day they caught a combination of Northern Pike and Smallmouth Bass. 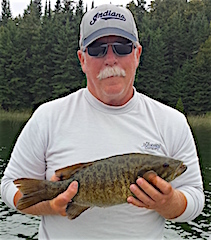 Day 3 was off to a portage lake to fish for Muskie & Smallmouth Bass despite the day starting out with heavy rain not ending until around noon. They did very well having 18 Muskie follows of all sizes, hooking up on 4, with Colleen getting as close to landing one by her Muskie hitting the side of the boat. 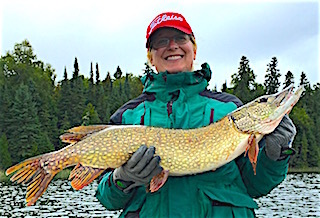 Also, Colleen did land a BIG FAT 35 inch Northern Pike & Fran caught a few Smallmouth Bass including a17.5-incher. 4th day was another numbers Northern Pike day similar to their first however they were less concentrated so moving was the key. 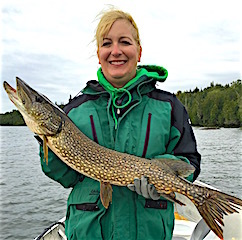 5th day was special in that Fran caught 3 Muskie including a 29” Tiger Muskie, and a 31 and very large 42-inch Muskie plus each caught a nice 31-inch Northern Pike. 6th day had Fran continuing his Muskie roll catching two more one being a Tiger Muskie. 7th and final day they catching a lot of Northern Pike and Fran caught his sixth Muskie of the trip. Both left having a fabulous stay and hope to be back. Tom & Jen Born from Lakeville, MN were visiting with us again for their 11th time. DOA Jen was catching fish immediately landing a SB & and Pike and having two of her lures bit off, just within and hour time period after supper. 1st full day they caught Pike & Smallmouth Bass each catching a big Northern Pike Jen a 33”, and Tom a HUGE 39” plus Tom caught the biggest Smallmouth Bass at 17.5-inches. 2nd day was met wit heavy rain until noon and Jen got soaked so Tom dropped her off and continued on to catch some nice toothy critters including a Tiger Muskie and a 38-inch Northern Pike, and had no choice but to tale a selfie (see attached) which gave a great perspective of his catch. 3rd day had them catching some nice Pike and the Muskie were moving having follows, having a few hooked, Tom caught a 30”er and after a long battle lost what they said was every bit of 48-inches. After having it just a few feet from the net the monster surged towards the boat smashing into the boat side coming unhooked. Tom had everything he could want catching a fish this size can offer except the picture. 4th day was challenging because of high winds managing to catch some nice Northern Pike. 5th & final day they enjoyed every last minute fishing and enjoying the wilderness, which abounds our area while catching some nice fish. Long time return guest from 1993 David Young was returning for his second time in 2016 this time with son BJ for what we think was BJ’s 7th visit. DOA they got right to it catching some nice Northern Pike before supper plus Dave had a HUGE strike near the boat just about ripping his rod from his hands. 1st day they caught a lot of Northern Pike and Smallmouth Bass with BJ catching the majority of his on a fly rod with flies he tied. Both were very excited and said they had a great day. 2nd day they did well catching Pike again on the Fly Rod and they got into a bunch of Smallmouth Bass by an island off a rock ledge at 15-20 feet. Next day was about the same and Dave experienced fast action Smallmouth Bass after dropping BJ off at 3:30 to run an errand. The soft plastic crayfish presented slowly was the key. 4th and final day they had high winds to deal with but still managed to have a good day catching Northern Pike & Smallmouth Bass. They both left feeling reunited making father and son memories.